Many, many years ago, I read an article in a magazine I recall as being fairly credible — National Geographic, maybe? — about a study done where they hooked up a polygraph to a couple of house plants. Don’t recall the names but they looked like a Dieffenbachia. 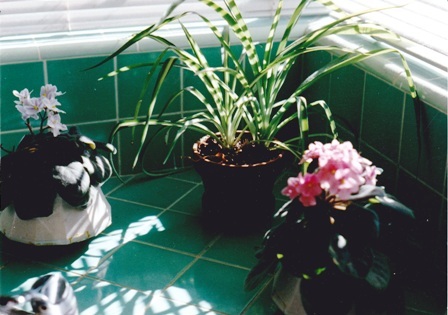 The plants were left alone in a room. Presently a nasty human entered and hacked one of the plants to pieces. As this was happening, the other plant registered distress on the polygraph machine. Having destroyed the victim plant, the nasty human left with his axe. Update: Then again, perhaps the vegetarians are right. Upon further research I am pretty sure this story is associated with a best-selling book from the 70’s called The Secret Life of Plants, by Peter Tompkins and Christopher Birds, neither of whom are actual scientists. I know that I did not read the book, so it was probably an article based on one of the experiments it recounts. This entry was posted in Goofy Stuff and tagged polygraph, secret life of plants, sentience on August 8, 2012 by Karen Hancock.